A Texas man learned on Facebook that his father had allegedly shot his mother and brother before killing himself. Jeril Jacobson, who was in his early 50s, shot wife Kathy and son Chris at their Tomball home at around 10pm on Thursday, leading neighbors to call police. His other son James Jacobson was not at the home at the time of the shooting, but saw posts about a shooting at his family's home on Facebook. Harris County officers found Jeril's dead body on the front lawn of the home when they arrived to the scene. Cops said it's not immediately clear if he shot himself or not. He raced to the home and arrived after a SWAT team had surrounded the home. 'I don't have a father no more. He's gone,' James said while choking back tears to ABC13. 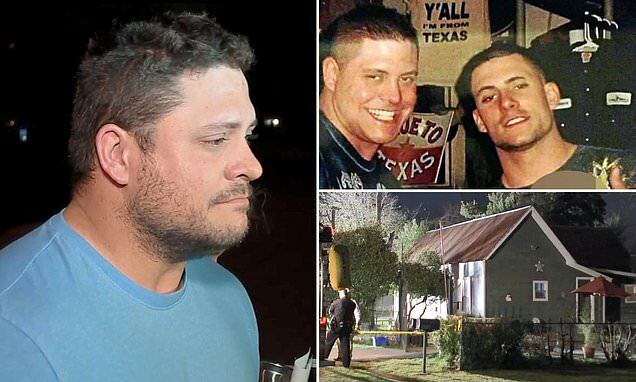 His brother Chris Jacobson, 33, suffered at least four gun shot wounds. He ran to neighbor Michael Baker for help, who found him bleeding profusely from his leg and stomach. 'When he fell into my arms, Chris said, "I'm shot! Dad shot me! I'm not going to make it!"' Baker said.